Habitat : Found throughout india in deciduous forests. Uses : Strychnos nux vomica is recommended for upset stomach, vomiting, abdominal pain, constipation, intestinal irritation, hangovers, heartburn, insomnia, certain heart diseases, circulatory problems, eye diseases, depression, migraine headaches, nervous conditions, problems related to menopause, and respiratory diseases in the elderly. In folk medicine, it is used as a healing tonic and appetite stimulant. 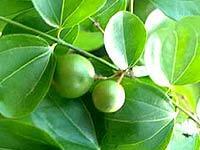 Nux vomica is a common homeopathic medicine prescribed for digestive problems, sensitivity to cold, and irritability. The senses of smell, touch, hearing and vision are rendered more acute, it improves the pulse and raises blood pressure and is of great value as a tonic to the circulatory system in cardiac failure. It is used in pruritis and as a local anodyne in inflammations of the external ear. The powdered seeds are employed in atonic dyspepsia. The leaves are applied as a poultice on sloughing wounds and ulcers. They are also used in the preparation of medicated product for the hair and scalp.